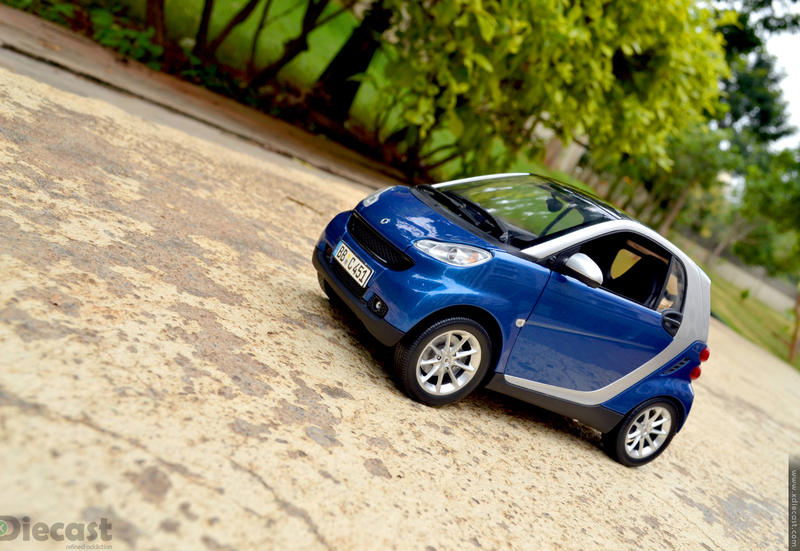 Smart Fortwo Coupe is a one of the many unsung heroes that Minichamps made! This is a very well made car both in real and also in 1:18 diecast scale model by Minichamps but it dint took off like it should have been! Why dint this model took the hearts and souls of some many diecast collectors who made so many a big hit! Read on to find out why? 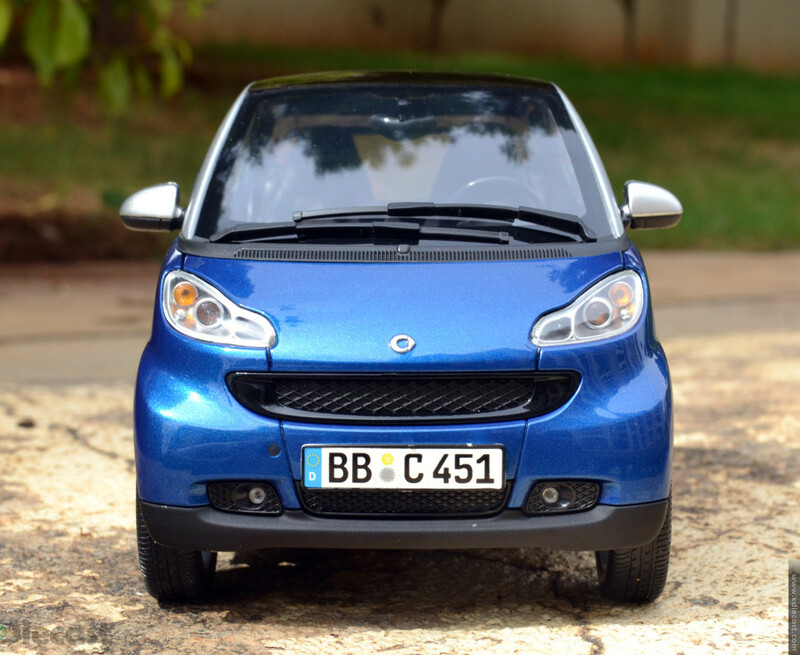 History: Smart Fortwo is a two-door city car manufactured and marketed by the Smart division of Daimler AG. Noted for its compact dimension, high seating and funky styling!Introduced in 1998 and marketed in 42 countries around the world, currently in its second generation(that we have here) and production has surpassed 1.16 million units by 2013. 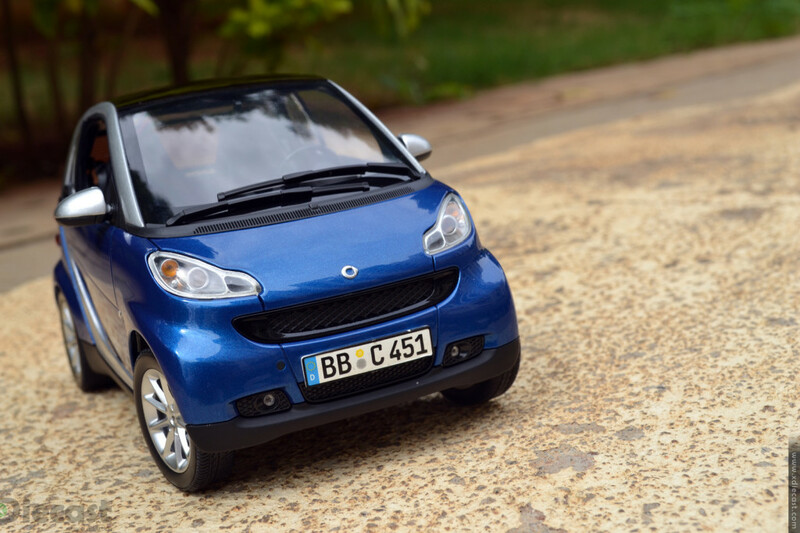 It is a rear-engined, rear wheel drive car that can take only two passenger and it is noted for its compact dimension, high seating and funky styling with exposed frame and interchangeable plastic body panels. 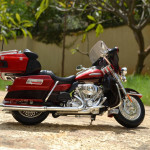 Power plant came in various forms from petrol, diesel and even electic that are designed to be fun in urban commute. 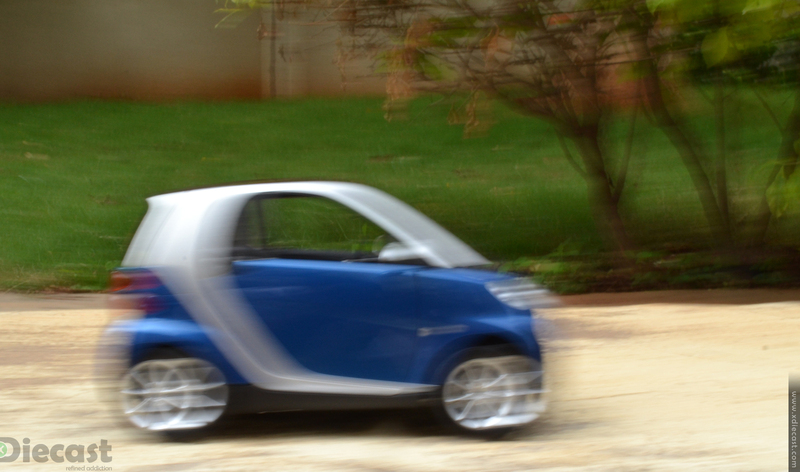 Paint Finish: The paint finish on this diecast Smart Car is top class on those blue panels and those exposed aluminum frame. The only issue that I could find in painting area is on the wing mirror as they have some smudging around the joints. 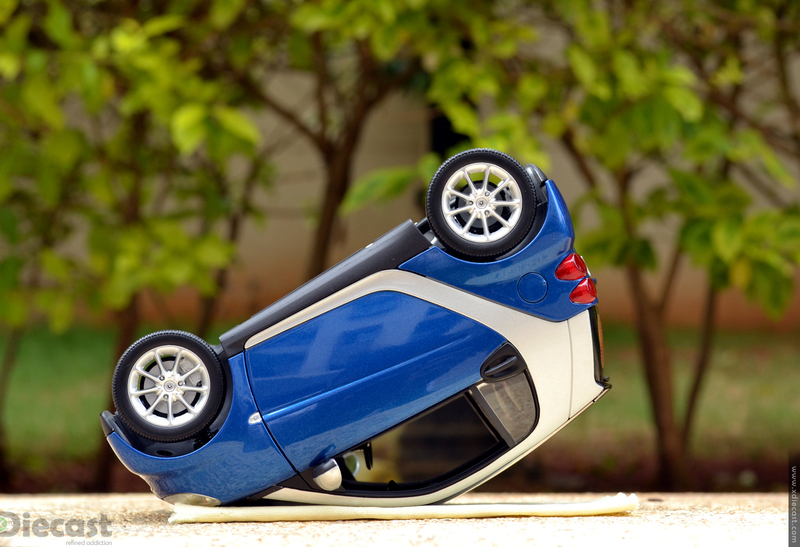 Decals: This Diecast scale model car has very less decals but they are tastefully done! The tampo style decals that are used for the badges are nice but they can be a little bit more sharper! 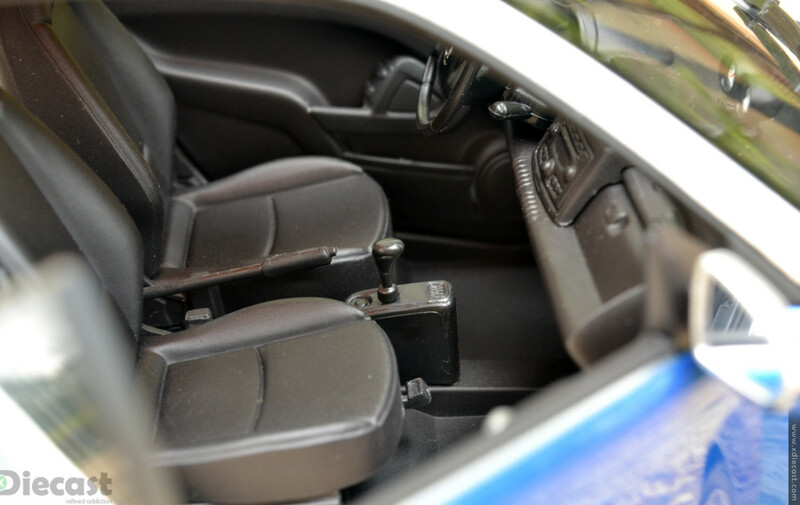 Body Work & Scaling: As is the case with many other Minichamps diecast cars this model also come with impeccable body work… you can touch and feel its quality all day long without finding even a single clog or air bubble. 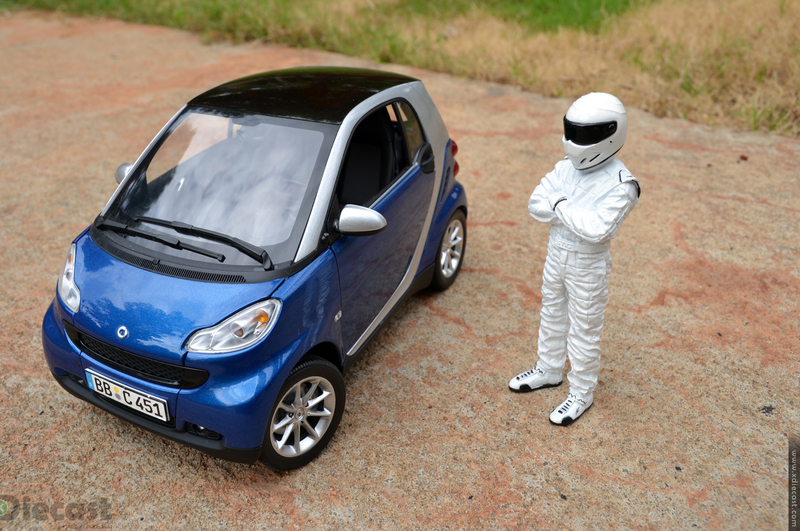 As far as my knowledge the scaling is never a problem with most Minichamps cars, the same work true for this scale model Smart ForTwo as well! 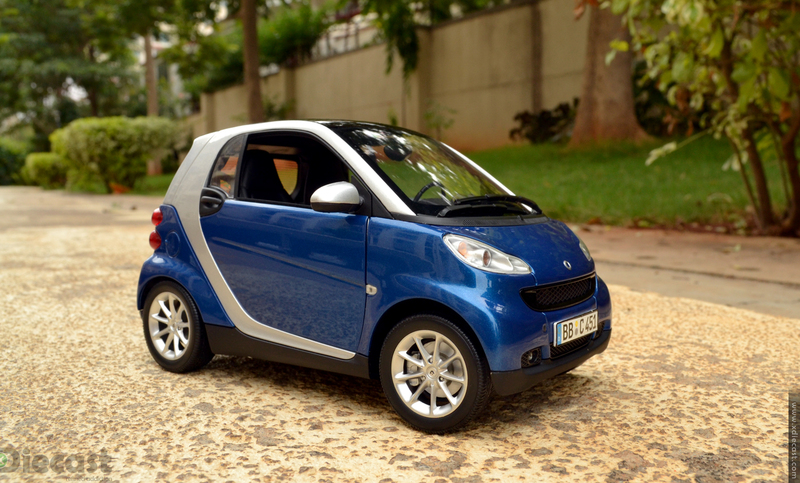 View it from any angle you would only get a feeling that its a super compact car that resembles me a Peg(though fully grown but still cute), which makes it impossible to find issues so please bare with me!! So after some playing around I found the one and only scaling issue… its the front wiper that are too big even for a full size SUV in 1:18 scale diecast model. 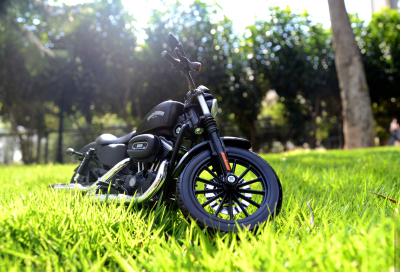 Details: Being a Minichamps it should have accurate details! 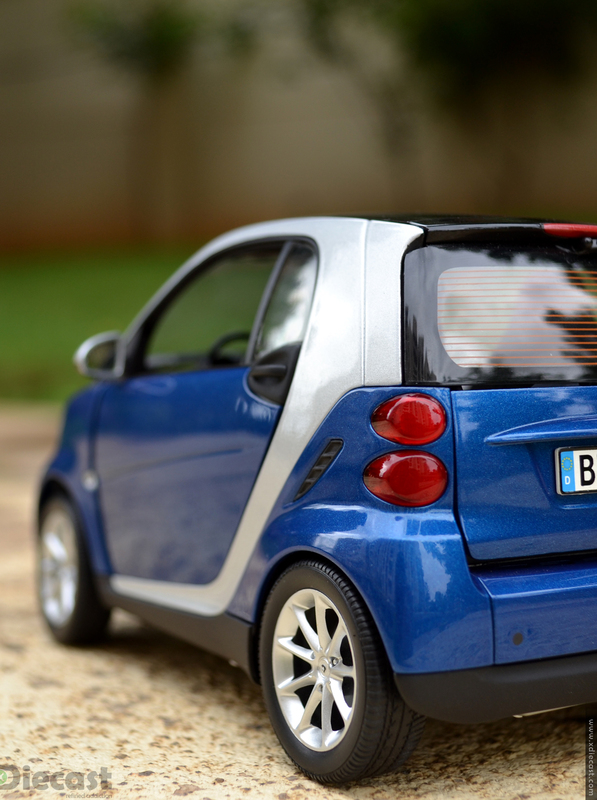 Yes this is a cute little car lots and lots tiny details, so it would have been a tough challenge!! And finally Minichamps have did their best, which transformed into this diecast model in 1:18. 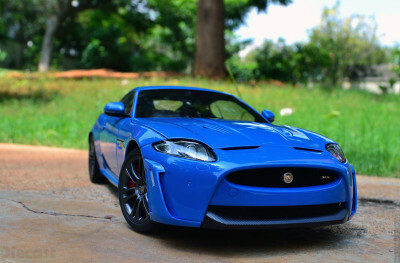 I kind of like the front end… the headlamp is an art work with some nice lensing and light barrels details, the air vents right under the wiper are neat and sharp adding a bit of premiumness to this car and finally the tail lamp cluster with neat arrangement takes the cake. Oh ya it came with a nice sleek radio antenna and I broke it when cleaning it a while back. One unsung detail is the license plates, which are actually plates not just some sticker job. 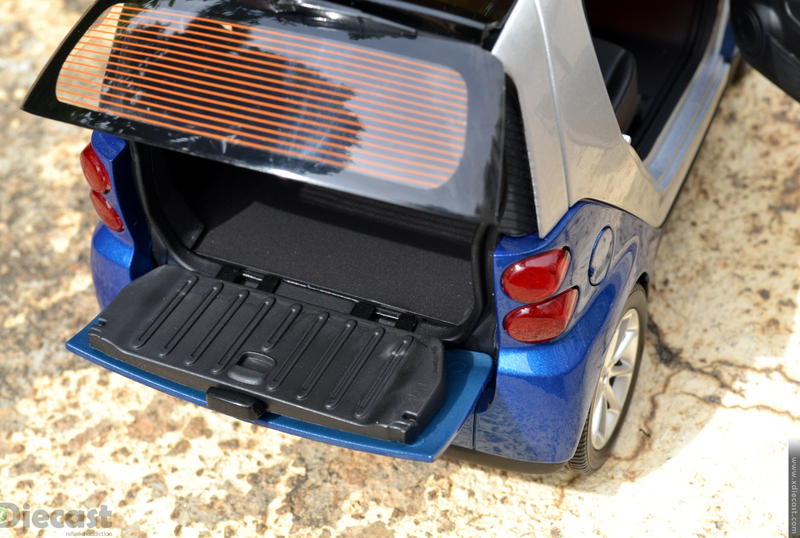 This Smart ForTwo Coupe model do comes with an array of issues when it comes to details… the front grills would have been better if they are real see tru type grills that you see in AUTOart or Kyosho model cars, the same go well for the rear air intake vent on the left side of the rear fender and gaps for the rear trunk lid is too obvious! 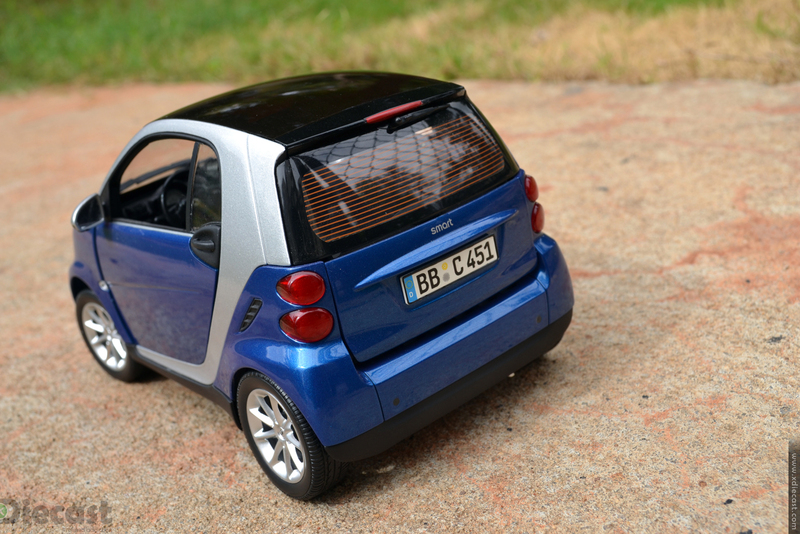 Doors & Hatch: Doors open wide as is in any diecast model car from Minichamps. 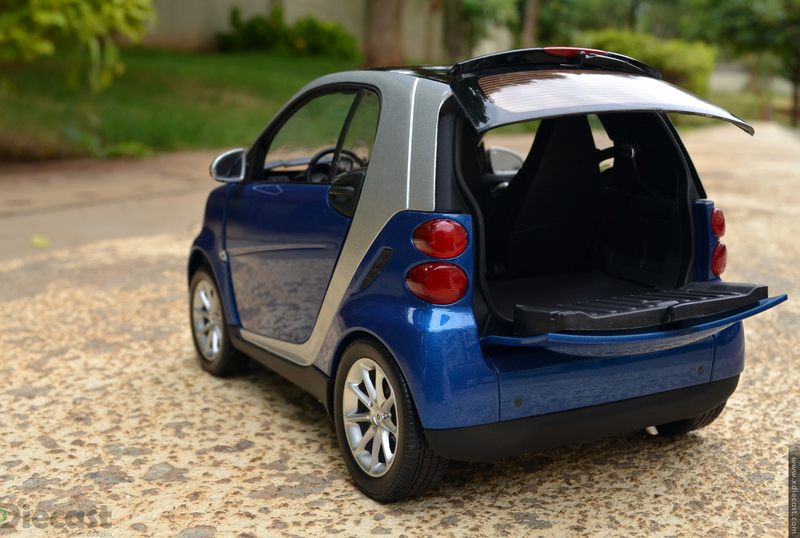 Even the hinge mechanism allows us to work the door more often… as these hinges are not bulky you can display this SmartForTwo model with its doors open to. 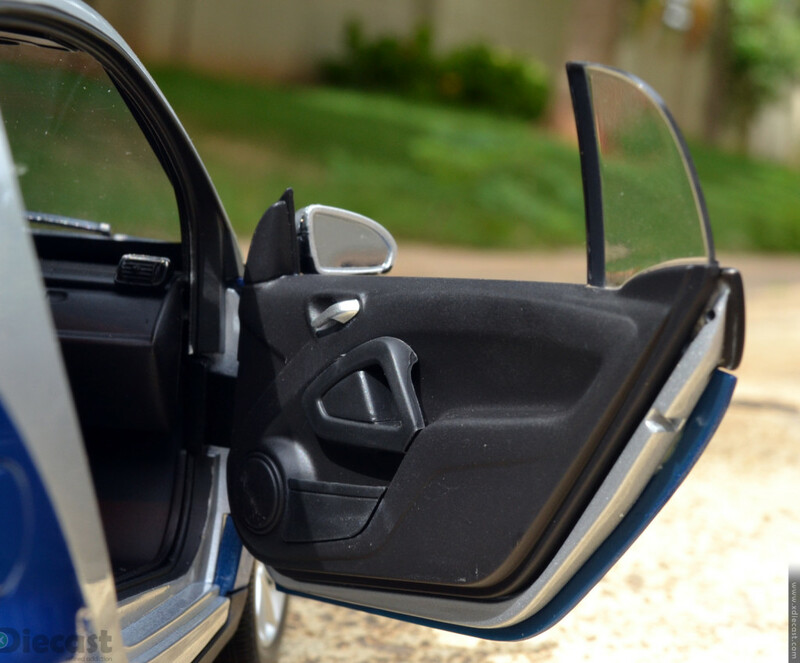 The rear hatch opens up in a split mode and that also has a nice hinge that keeps the glass hatch up without any issues. The lower trunk style open also has some nice texture, which adds a bit of premiumness. 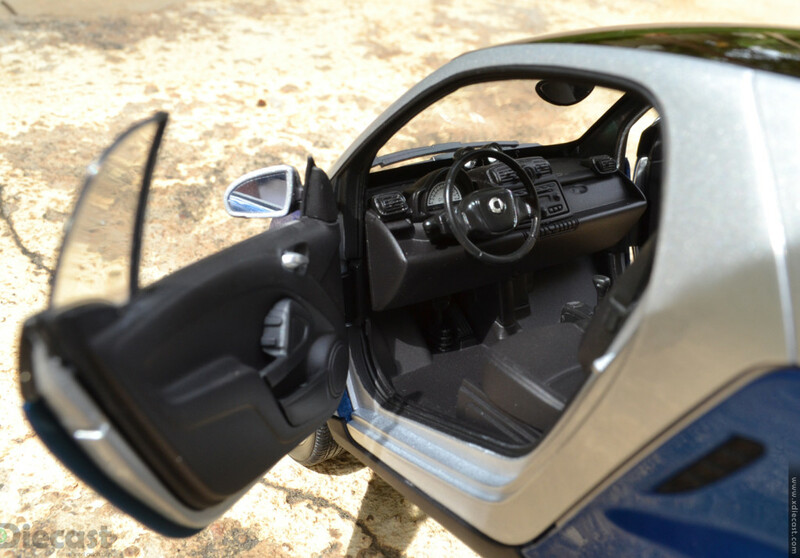 Interiors: This model comes with door that opens wide as is in the real car so inspecting the interiors and admiring them is not an issue. There are quite a lot of tiny details like the periscope like dials, clear speedometer, audio system with clear buttons etc. There is no carpeting! 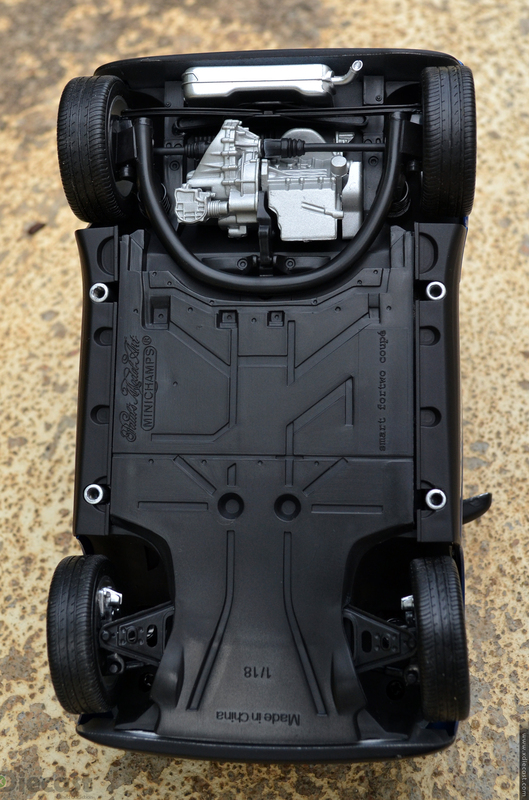 And the material used is all black plastic… even the seat-belt buckle is in black!! Come on Minichamps even Maisto gives chrome buckle! And the biggest bummer is the missing speedo needle in that large dial!! Overall the interior is nice but lacks the punch factor! The doors are tastefully but the gaps are too intrusive! 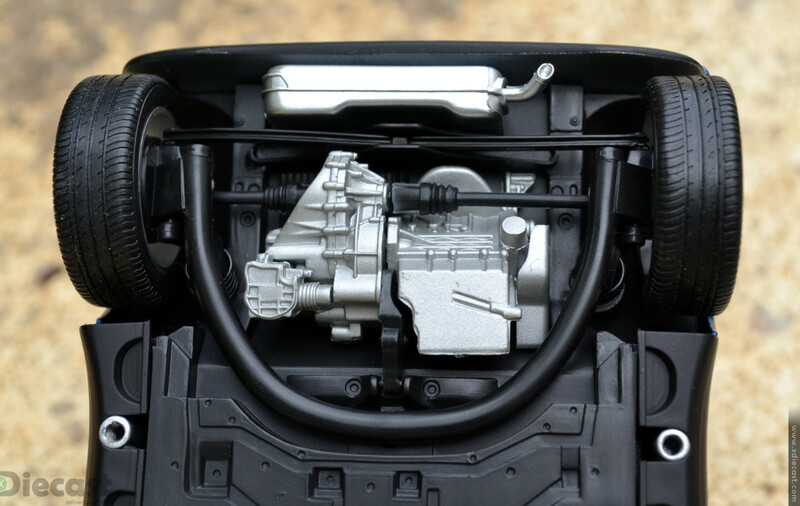 Underbody & Engine: Being a rear wheel drive car the engine is accessible only from the rear hatch…. this being a model that access is restricted so only way to view them is from the bottom! But I have to say if the word “attention to details” then it is here… Check out the details and materials used… the axles, the roll-bar, exhaust system, suspension springs(fully functional), rubber shrods for the drive train connection and finally the engine casing itself are very well executed. 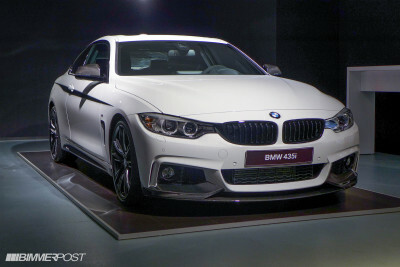 Even the front is not left alone.. the steering system is quite a looker and very functional. Just for Kick! Before we get into serious matters, lets have some fun… Have you ever seen a car doing Yoga or Diecast car speeding or STIG in Smart ForTwo car?? I managed to do them all with just this car. 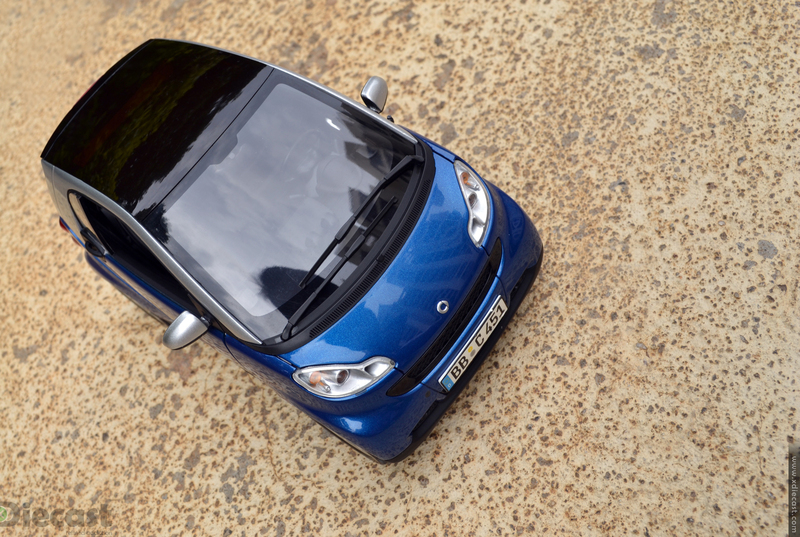 Verdict: This is the most paint part of any review… and the most sorted for you readers!! 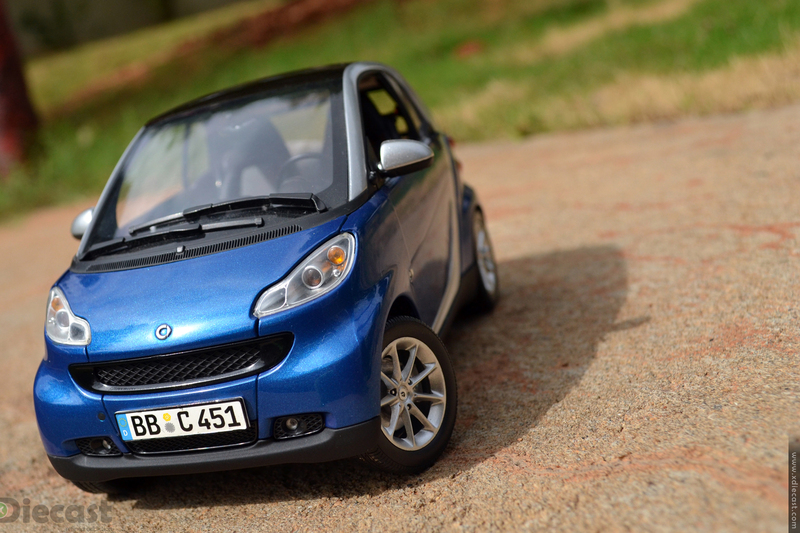 So here I go… This Smart ForTwo Coupe is a very well executed diecast scale model in 1:18 scale! But what went wrong is the overall package and lacking attention, which in first place the real car contradicts with this. If you go piece by piece it take all the right boxes but on the whole its lack desirability! So I give a generous 3.5 as all the points don’t count if you see this as an other piece in your hatchback foray!! Beautiful photo works. Where do you buy this diecast? I buy these locally and also import!